Westcare Industries in Bassendean is working with Loop Upcycling http://www.loopupcycling.com/ to manufacture Teddy Bears from unwanted/ discarded corporate uniforms which would otherwise be sent to landfill. Dwayne Rowland, the founder of Loop Upcycling, makes the connection with the corporate companies and pitches the idea of sending unwanted corporate wear to Loop instead of to landfill. He will upcycle the goods and make teddy bears (and other items) and the corporate organisation will buy the bears back from thus supporting people with disability at Westcare. Upcycling is the process of transforming by-products, waste products, useless or unwanted products into new materials or products of better quality or for better environmental value. Loop has made a strong connection with Virgin Airlines https://readyfundgo.com/project/loop/ and has pictures of Richard Branson holding his bears. There is a strong possibility Westcare Supported Employees will be making a substantial quantity of bears for Loop from Virgin Airlines unwanted corporate wear, cabin crew and pilot uniforms. Once again, Virgin will be buying the completed bears. A win win enterprise: Westcare earns revenue from manufacturing the bears, Supported Employees have gainful employment and Loop, through Western Australian corporate organisations, provides the raw materials. Westcare Bassendean have also started making multi-use shopping bags from unwanted T-shirts. Cynicism about the incoming National Disability Insurance Scheme (NDIS) has created an opportunity for Nedlands-based disability employer Westcare, according to CEO John Mitchell. Westcare’s 70 year anniversary is commemorated today with a pull-out in the West Australian Newspaper. This records Westcare’s unwavering commitment to supporting Western Australians with disability. A significant milestone has today been commemorated in the West Australian Newspaper with a pull-out featuring the journey of Westcare over 7 decades. Formerly The Tuberculosis and Chest Association of Western Australia, the not-for-profit organisation was formed by a group of medical doctors to facilitate the restoration to health of people suffering from tuberculosis. Today, in recognising the ever growing number of people across WA with a disability, there is more relevance than ever before in society for the works of our organisation. Click to read Westcare's The West Australian lift out. President Sue Morey and CEO John Mitchell on behalf of the organisation, have denounced unscrupulous operators operating under the auspices of charity. The President responded to a distressing programme, aired on the Sunday Night Program on Channel 7 last Sunday (18 June 2017) depicting the unscrupulous actions and methods of fundraising employed by certain charity contractors. As donations from the public become increasingly more difficult to gain, Supporters and Donors are assured that Westcare does not engage external contractors or companies to conduct our fundraising. Westcare conducts two fundraising appeals annually (June and December) by contacting our valued supporters via a direct appeal letter. Every cent of all donations, with the exception of bank handling charges on donations paid through the Give Now website, are used for our residents and supported employees with disabilities. Administration charges are funded by the Westcare commercial industries. This year’s appeal funds will go towards a minibus for our Westcare Accommodation Village residents. Not only will the vehicle enable them to be transported to local shopping centres, social activities and entertainment venues, but importantly, the bus will be on hand to be used in the instance of emergency evacuation. A few years ago a bush fire threatened our Village necessitating the evacuation of residents by staff and the public using their private vehicles. Westcare Inc is this year proudly celebrating its 70th year supporting Western Australians; initially as The Tuberculosis and Chest Association of Western Australia and since 1992, as Westcare Inc. Established in support of people suffering from Tuberculosis (TB), the organisation has more latterly encompassed caring for people with disabilities. Vinod Kamboth started with Westcare early in 2016 as Quality Assurance & Food Safety Officer. Prior to Westcare he worked for International Standard Certifications Pty Ltd and SGS as Nationally Accredited Auditor for Quality, Safety, Environment & Food Safety Standards. Vinod has worked as Regulatory Food Safety Auditor for Department of Health WA along with other organisations and has worked all over Australia accruing many, many air miles and going forward these will only increase. Vinod is now sadly leaving Westcare to join DNV GL a global auditing company specialising in assurance services as Lead Auditor. This new role will may even see Vinod returning to audit Westcare Group in the future. “As I move on, I would like to take a moment to remember and cherish our times together. I have enjoyed my tenure here and I appreciate having had the opportunity to work with you all. Thank you for the support, guidance, and encouragement you have provided me during my time at Westcare. It has been amazing working with you all these last couple of years. I will miss my colleagues and the company. I do wish you all and the company every success in all its future endeavours”. As Westcare Incorporated holds its own in a tough print industry market, high hopes are pinned on their pre-press apprentice Jay Brown to bring home gold from the national print awards. The 2017 National Print Awards sponsored by Media Super to recognise and encourage the achievement of excellence in print in Australia will be held in conjunction with the PacPrint Exhibition in Melbourne next week. Jay Brown won the Western Australian Young Executive of the Year Award in 2016 and was runner up in the WA Graduate Apprentice of the Year award sponsored by the Lithographic Institute of Australia. State winners received a trophy and all-expenses trip to attend the National Print Awards for bi-annual national title judging. Last year’s awards saw over 700 entries received from across the country in 18 general print categories, five design categories and the Media Super award and this year, the challenge is even greater. State winners of the prestigious titles last year, including the Westcare apprentice will be put through a rigorous interview regime by an illustrious panel of highly acclaimed judges from within the Australian Print industry. The winner will be announced at the 34th National Print Awards Dinner in Melbourne on Thursday 25th May 2017. Charlie Paganin is a young artist who loves painting and drawing. Through his art, Charlie who is autistic, is able to communicate and connect with the community about his world. Westcare Support Services Manager Sherry Kaur linked Charlie’s parents with a programme to further his interests and to harness his abilities in the area of his specific interest. Consequently Charlie received an Arts Nexus Grant to develop his visual art. Charlie was excited about his Art exhibition and he was a good host. He was delighted to see Westcare staff at his exhibition. Westcare’s Sherry Kaur and Support Services Officer Janel Wong attended Going Around in Circles, an exhibition by Charlie Paganin who has been a supported employee working with Westcare for the past two years. Charlie also won the recent Westcare Seals Competition designing the current set of Christmas Seals which display the Lorraine Cross (linked internationally with respiratory illness, in particular Tuberculosis) sent annually to all Westcare Donors and Supporters in aid of Westcare. Coinciding with the recent Christmas party was the presentation of the annual Westcare awards. Cheered by family and peers the award winners were presented their awards by Westcares’ President Sue Morey assisted by Chief Executive Officer John Mitchell. John Mitchell paid tribute to each award winner as he highlighted their achievements from the past year. Dr Bob Elphick Award for Employee of the Year in Westcare Industries, Nedlands was awarded to Stephen Timms. Dr Alan King Award for Employee of the Year in Westcare Industries, Bassendean was awarded to Jacinto (Jac) Lim. Linley Henzel Award for Staff Member of the Year for Service to the Association was awarded to Annie Lambrechts. Peter Wall Award for Outstanding Service to our Employees was awarded to Sherry Kaur. Themed “Christmas, the season of goodwill”, the annual Westcare Christmas party was yet again, another success story. Hosted at the Westcare Accommodation Services Village in Shenton Park, the Christmas Party was attended by over 160 staff members and Board Members. Westcare Ambassador, Rick Ardon from Channel 7 was able to join us briefly between breaking news interviews and in his inimitable style, thrilled the supported staff by posing for an endless demand of selfies. The weather was not too hot ensuring the music was appreciated. The dancing, always a favourite, was this year matched with assorted renditions of favourite karaoke hits by extrovert supported employees, staff and even the CEO. The combination of great food and good company saw another successful Christmas party for the supported employees and staff of Westcare. The annual Westcare Awards were presented at the function by President Sue Morey who was assisted by CEO John Mitchell. Thanks to all the staff who worked very hard to make the day so enjoyable for the supported employees. The WA Governor, Kerry Sanderson has presented Westcare Vice President Sue Morey OAM and long-standing Westcare Board Member Ruth Reid with the prestigious Freeman of the City Awards. The City of Nedlands Freeman of the City Award recognises the outstanding achievements and dedicated service to the community by a person over their lifetime. A maximum of only six living persons may hold the prominent title of “Honourary Freeman of the City of Nedlands” at any one time. The City of Nedlands held a formal ceremony to celebrate the bestowal of the Honorary Freeman of the City of Nedlands on 30 November 2016 where the Governor of Western Australia presented the eminent recipients. Amongst the special supporters and privileged guests invited to witness the ceremony were Westcare CEO John Mitchell and Westcare President, the late Alan Tough OAM. An Honourary Freeman of the City must have served the community of the City of Nedlands in an outstanding and meritorious manner that stands above the contributions of most other persons, and whose activities have contributed significantly to the wellbeing of the City's residents. The Freeman of the City Award is the highest honour that the City of Nedlands can give to a community member. Governor Kerry Sanderson presents Sue Morey OAM with Freeman of the City award. WA Governor Kerry Sanderson presents Ruth Reid with Freeman of the City Honour. Esteemed President of Westcare Incorporated, Alan Ronald Tough OAM passed away on Wednesday 23 November 2016 supported by his family. Alan was born in Perth, Western Australia on Thursday 25 May 1939 to Ron & Ethel Tough, Alan was the oldest of five children. Alan who lived his entire life in Dalkeith was educated at Scotch College and University of WA. Like his father he graduated with an engineering degree and later returned to UWA to complete further business degrees including his Master’s Degree of Business Administration. Born into a well-known sailing family and living only a pebbles splash from the Swan River, Alan spent a lifetime “mucking around in boats” as he liked to describe his hobby. Introduced to sailing aged about five when securely tied to his father’s yacht, it was inevitable that he too would be a sailor and like his father before him a leader in the sailing arena. Not only was he to become a noted sailor, he was through his drive and integrity to become a ‘slave’ to the advancement of the sport and an innovator enhancing the progress of sailing through a changing era – a much respected leader of Australian yachting, providing a contribution way above and beyond the norm. From an early age Alan was a visionary, an entrepreneur, orator and natural leader of people – an outstanding achiever. Whilst his interests amongst others, included sailing, aviation, wood working, building model yachts and aircraft his early adulthood was a challenge. He enjoyed a sojourn in the Royal Australian Air Force undertaking RAAF Pilot Training. In his life book he notes “The RAAF and the services have been a generous and kindly influence and I owe them a great deal”. Due to illness he found himself a single parent to his three young daughters whilst admirably meeting the challenge of establishing and balancing a very demanding professional career. Alan worked in numerous countries around the globe and across Australia in the engineering, mining, commercial, development, scientific and government fields. In 1992 Alan married Liliana and his son Benedict (Beni) was born. Over the years, Alan took on several Board Directorships, which in 2002 included Westcare Incorporated. Westcare is a not-for-profit organisation providing training, employment and accommodation for people with a disability. In 2006 Alan became the 7th and second longest serving President. Alan has with enthusiasm and energy, driven change, growth, acquisition and vision for the organisation now in its 70th year which will ensure the organisation remains viable and true to its mission going forward. A stickler for professionalism and integrity, Alan conducted his business and personal arrangements with the utmost integrity; “Above all – Honesty” was a motto he lived by. With his quick mind, vision and advanced thought process he was a big picture person who to the end had great plans for the future, a future which was untimely cut short. Ave atque vale (hail and farewell) Alan Tough, an honoured and respected President who will be sadly missed. Westcare extends condolences to Alan’s family – Liliana, Samantha, Megan, Bronwyn & Beni and to his brother, Trevor and sisters Diane and June. The 2016 Dr Alan King Westcare Grant was last week presented to Dr Holly Clifford by Westcare Chief Executive Officer John Mitchell in the absence of Westcare President Alan Tough due to illness. The annual award ceremony held of the Institute for Respiratory Health was held at the Harry Perkins Institute of Medical Research, QEII Medical Centre, Nedlands. Dr Holly Clifford, Research Fellow, Telethon Kids Institute was the recipient, her project being Environmental dust exposure and bacterial lung infections: their impact in remote Aboriginal Australian communities. Westcare are continuing the medical thread with which their origins are linked. Dr Alan King was one of the founding medical physicians who in 1941, established the Wooroloo rehabilitation and sheltered work facility for patients disabled by the tragic scourge of tuberculosis. The facility ultimately moved to Perth where it morphed through various transitional stages to become Westcare. At the annual Printing Industry Craft Awards last week, Jay Brown Westcare Print’s pre-press apprentice won the WA Young Executive of the Year Award sponsored by Media Super and was runner up in the WA Graduate Apprentice of the Year award sponsored by the Lithographic Institute of Australia. The awards help celebrate the national printing industry which employs over 32,000 people directly in more than 5,000 businesses across Australia with revenue of $10 billion and more than 110,000 people indirectly. Westcare CEO John Mitchell, Director of Industries Mark Forrest and General Manager Print Andrew Larter supported Jay and his partner attending the PICA Awards dinner. President Alan Tough was unable to attend due to illness but proudly sent his congratulations to both Jay and to Westcare. CEO John Mitchell congratulated Jay stating “ in winning this award Jay demonstrated both his professional expertise at Westcare Print and an outstanding commitment to his personal and professional development in the print industry”. State winners received a trophy and all-expenses trip to attend the National Print Awards for bi-annual national title judging. The national winner will receive a $2,000 superannuation account contribution. Nedlands has recognised three local women as valued members of the community, voting this week to name them freeman of the city. Honoured are Ruth Reid, Sue Morey OAM and Mary “Lennie” McCall. The title dates from feudal times when only men were honoured. Naming three female Freeman at the same time is thought to be unique. Ruth Reid already holds the honour of Freeman of the City of London and Freeman of the Perth. Lennie McCall’s innovative work in the State Library continued well after she became director of the Battye Library. Her strong interest in WA history saw her also become as office bearer at the Royal WA Historical Society. Ruth Reid, long time Board Member of Westcare is recognised for her extensive volunteer community work for a wide range of charities and the Battye Library. Sue Morey OAM and Vice President of Westcare, is a nurse practitioner in respiratory medicine at Sir Charles Gairdner Hospital. She holds several board positions, and is the longest-serving registered nurse at SCGH with 40 years of continuous service. Congratulations to Jay Brown, Westcare Print’s Pre-Press Apprentice at Nedlands who has been nominated for the prestigious Heidelberg Graduate of the Year Award. These awards are held every year, in each state of Australia. Jay did his design training, as well as completing a Certificate III in Printing and Graphic Arts through TAFE SA and is now embarking on his Certificate IV. To be nominated as a candidate for the L.I.A. Graduate of the Year is a wonderful honour, for both the nominee and their employer. The calibre of candidates is extremely high and the selection of the winner is carried out by an experienced committee. These awards are held every year, in each state of Australia. The object is to acknowledge the nominees’ achievements and to provide an incentive for them to further their knowledge and skills within the industry. The winning Graduate of the Year will go forward to represent Western Australia in the National Graduate of the Year Awards, which is held biannually in the Eastern States. Westcare have recently been audited by ISC to ensure we meet the National Standards for Disability Services and the ISO 9001 standard for Quality Assurance. We are proud to be able to include the NSDS Audit Report and ISO Audit Report outlining Westcare's compliance with all standards. Well done to all the Westcare staff, especially our fantastic Support Workers, for making Westcare a great place to work. ISC are a global independent certification specialist. As a Registered NDIS Service Provider Westcare Support Service Staff attended an NDIS Expo for Providers at the NDIS Offices in Midland (WA) on Wednesday 13th July. The NDIS Expo offered a great opportunity for people with disabilities along with their families and carers receive information about supported employment options and other services that Westcare provides. Westcare’s Support Services Manager Sherry Kaur and Support Services Officer Janel Wong spent the day meeting people and chatting to them about Westcare’s industries and the Accommodation Village. Westcare CEO John Mitchell congratulated Print Manager Andrew Larter and his staff on the delivery of the first batch of Purple Books delivered to the Health Department in early June which resulted in great feedback from the agency staff. In February 2016 after many months of negotiations staff at Westcare Print in Nedlands began work on a new project for the WA Health Department to produce the personal health record books for all new babies born in Western Australia. The baby book, better known as the ‘Purple Book’ is a document for new parents and medical practitioners to record early year’s development of all newborn babies in the state. Andrew Larter said “It’s a complex project requiring a variety of technical and manual operations to create the finished book and all praise should go to the flexibility and work ethic of the staff and supported staff members involved in its production over the past few months. To understand the scale of this project, in the next 12 months our supported employees will convert around 5 million pieces of paper into 40,000 purple books for use throughout WA”. John Mitchell, Westcares’ Chief Executive Officer congratulated Andrew Larter and his Print staff on their efficient waste management and environmental practices which Westcare has steadily instituted to process efficiency and combat old ways using modern management systems. Westcare Bassendean has been working with local schools to offer their Special Education students an opportunity to gain valuable work experience in a commercial business environment. In conjunction with their studies Westcare is assisting the students to become ‘job ready’. The students would normally attend our production facility in Bassendean for 2 days per week for a 20 week semester. The students complete a Westcare Safety induction and then join the production team in either our Box, Safety, Industrial Packing or Foodpak divisions. Students learn to work with others, undertake tasks which are directly related to customer orders and get a feel of what working for a living is all about. The goal is to teach the students to be independent of the teacher assistants who accompany them on their work experience. Westcare is proud to be associated with the following schools which each run a ‘special education’ program for children with some form of disability which affects their learning abilities: John Forrest Secondary School, La Salle College, Mirrabooka SHS, Servite College and Canning Community Support Centre. Normally youngsters finish school in Year 12 but participants of the Special Ed Program can go on to Year 13. Of the 15 students who have completed work experience since February 2015, seven, all aged between 16 or 17 years have been employed by Westcare and are now part of the Westcare team. Congratulations to Alex Ferrone, Sam Rector, Anita Rigby, Adam & Blake Tranter and Kyle Fallapi. Chief Executive Officer John Mitchell has notched up five years with Westcare. Mitchell with his strong background in corporate, resource and not-for-profit sectors, was brought on board in 2011 charged with implementing change requiring immediate tough decisions, particularly in staffing, and swiftly transporting the company from an unsustainable deficit back into the black. After more than six decades of operation and with a refocused vision, this five years has seen the Change Agent Mitchell ride some stormy seas. The downturn in the cyclical resources sector has made things tougher with some illusive targets for Westcare industries, this coupled with the current political uncertainty is challenging. Not shy of challenge the CEO said “We need to move away from the bounds of historical restraints and advance the Westcare Vision through the next decade as we build on opportunities to create new and interesting things with renewed social purpose and grit – this is achievable with constant monitoring of our strategic planning”. “We will advance with the utmost diligence and through the identification of suitable acquisitions which fit with our ethos to ensure the longevity of Westcare for another 70 years. John Mitchell has skilfully navigated the tempest with vigilance, adjustment and modified tactics, and coupled with the strong backing of his Board, age and energy on his side, it is envisaged that Mitchell will helm Westcare into its eighth decade. Our oldest Board Member now aged 95 stole the show at the recent Westcare supporter morning teas. Mrs Ruth Reid, wife of WA Governor the late Gordon Reid was an active Westcare Board Member from 1997 to 2006 and has been a staunch and loyal supporter since. As a Freeman of London she has the rare privilege, amongst other privileges, to drive her flock of sheep across London Bridge – this certainly brings a wicked smile to her face and many an offer of help. The privilege is Westcare’s – going into its 70th year of operation Westcare has cared for people with a disability (initially Tuberculosis) for nearly 7 decades and in recognition of the many supporters who help Westcare attain their goals, guests are thanked at morning teas. Over one hundred Westcare’s supporters have gathered at the three recent Westcare teas held at their sites; Westcare Accommodation Village (Shenton Park), Westcare Industries (Bassendean) and Westcare Print and Head Office (Nedlands). Hosted by Westcare President Alan Tough OAM, Westcare Vice President Sue Morey OAM and CEO John Mitchell, Westcare’s guests are surprised to witness the magnitude of the operation and to learn of the high profile organisations who contract Westcare with their printing, box making, food packaging and safety gear requirements. Westcare Ambassador Rick Arden (Channel 7 News Reader), another stalwart, steals the show being in great demand posing with our supported employees for photo shoots. Westcare Ambassador and Curtin Radio’s Jenny Seaton eloquently presents the Westcare overview via a CD which CEO john Mitchell presents to the guests whilst furnishing them with an overview of the organisations future development. The dedication to Westcare from within their ranks and from the greater Westcare ‘family’ of supporters is phenomenal – there is no greater importance to the wellbeing of the organisation. John Elliott shares his ANZAC history with CEO John Mitchell & President Alan Tough (both pilots) and James Gardner. Wow, so much history and so much justifiable pride! Westcare observed its own ANZAC celebrations yesterday with a nod to its own history and a salute to the soldiers who returned to WA, broken and suffering from the World Wars. Many of the Westcare’s Staff had their own family history to celebrate and share, encouraged by the caring and supportive ‘Westcare family’. The ANZAC lunch saw Westcare President Alan Tough OAM and Chief Executive Officer, John Mitchell, mingling with the staff whilst enjoying a sausages sizzle expertly cooked in the pouring rain by WKR Chefs, Scott and Josh. Regaled with many interesting stories of forebears who had parts to play, both great and small but equally significant, in the different wars and foreign campaigns, Alan and John (both pilots) were especially fascinated to hear from John Elliott. John, despite his hearing impairment explained how his father, Flying Officer David Thomas Elliott, born in Kalgoorlie in 1923, had distinguished service in WWII with the RAAF and RAF. As a young Aussie, far from home, FO Elliott joined the 159 Squadron and was despatched to RAF Molesworth UK for training in 1942. His squadron flying B24 Bombers flew 25 missions and 5 top secret missions in addition to mine laying and reconnaissance in the Middle East, Africa and Asia. ANZAC Day highlights Westcare’s origins; the establishment in the early 1940’s of a hostel, sheltered workshop and homes built in an orchard by a group of Doctors east of Perth at Wooroloo, to cater for the WW1 & WWII Diggers who returned suffering from the debilitating Tuberculosis (TB), an infectious disease that damages people’s lungs causing serious illness and death. Westcare’s unique Accommodation Village in Shenton Park welcomed Supporters and Donors at a special morning tea earlier this month. Welcomed by Westcare President Alan Tough, the guests enjoyed freshly baked scones from the village kitchens whilst getting an overview of the history of Westcare which has its origins in the rehabilitation of people suffering from tuberculosis. Molly Angus, a long-time supporter and guest shared her story with everyone present; Molly’s Mum regularly received the annual Westcare seals which she applied to her Christmas greeting cards and as a teenager, Molly determined to continue the tradition. Molly became a Westcare donor at this time and has continued her support over five decades. Annually Westcare launches a mid-year and a Christmas fundraising campaign. Mid year generic seals established by Chief Executive Officer, John Mitchell and charity Christmas seals bearing the distinctive red Lorraine Cross are sent to hundreds of donors across Australia raising valuable funds for people with disabilities. Designed by local school children the seals observe holidays such as Christmas, Valentines Day, Easter, Mother’s and Father’s Days, birthday etc. In 1979 Westcare instituted the building of their Village in Shenton Park. The Village, a one of a kind in Australia, provides accommodation for people with disabilities who are employed in the community and also provides an individualised transitional living program for people with a disability who want to learn to live independently in a home of their own. Guests were clearly both impressed and somewhat surprised at the five star standards of the one bedroom units, the dining facilities, gym and social areas which Accommodation Services General Manager Bruce Bowe showed them through. CEO John Mitchell and Max Hipkins, Mayor of Nedlands, enjoying the Westcare Christmas party. Happy new year to you all. I hope you celebrated the start of 2016 in good spirits with family and friends. Now that we’re well into the new year it’s good to look ahead and think about what this year may hold for Westcare. The year ahead is shaping up well with early promise to be good and productive. We’ve encountered a couple of speed humps of late in a slow and less than favourable market with the mining boom widely taking its toll across the state however, I am optimistic about Westcares’ future. Mark Forrest is settling in to his role and now has a good understanding of what is required to get our Industries Division performing to expectations. Westcare, in continuing the medical thread with which their origins are linked, proudly provided a $50,000 Alan King Westcare Grant to the Institute of Respiratory Health (IRH). Westcare continues via their grant to support laboratory, clinical and epidemiological research into the cause, diagnosis, prevention and treatment of respiratory infections including tuberculosis and a commitment to fighting lung disease through world class research. The Westcare Christmas party was a success and was well received by all supported employees and residents. We had a number of Board Members in attendance also the Mayor of Nedlands and our Ambassador Rick Arden from Channel 7. This is the first time (in my tenure) we have held the Christmas function in-house and, due to its success, we intend to do the same this year. Congratulations to the staff members who received awards: Leanne Fairley, Daniel Pinker, Brad Stickland, Di Henningsen and Nathan Bullivant. I believe that the staff awards were much more credible this year being held at the Christmas party instead of the AGM. Award recipients got more recognition from their peers and management which added to a better experience for them and it is my intention to continue this practice going forward. On Australia Day, our Westcare President, Alan Tough was recognised in the Australia Day Honours Awards with an Order of Australia Medal for his long and dedicated service to the community. A second nomination from a different arena, saw him additionally recognised for his considerable contribution to the sport of sailing. Within Westcare we have embarked on some new and exciting strategies which may be executed during the year. The Board of Management last month conducted a half day workshop during which they identified a strategic pathway taking the organisation forward over the next five to ten years. In 2015 we took significant steps to de-risk and strengthen our Balance Sheet, we strengthened our financial buffers to capitalise on investment opportunities to grow our business providing quality employment and training for Western Australians with a disability. Westcare is now registered for NDIS and once clarity has been established we will move forward. We continue to work amicably alongside the state and federal government departments with whom we have a solid understanding and a good relationship. I will keep you posted on further developments as we move forward. In keeping with Westcares’ on-going commitment to provide quality employment and training for Western Australians with disabilities, Support Services Officer Sherry Kaur arranges guest speakers and educators to present topical information and training to Westcares’ supported employees. Karen White from WALGA’s RoadWise program addressed the Nedlands Supported Employees on the do’s and don’ts of crossing roads and following road rules. The Supported Employees were given the opportunity to interact with Karen in smaller groups to ensure that they were comfortable asking questions and understanding WALGA’s message which Karen adapted specifically for their needs. In thanking his staff on their commitment to the Supported Employees and to upholding the ethos of Westcare, Chief Executive Officer John Mitchell also praised Ms White on her most effective and meaningful delivery of a topic which many of the employees have difficulty with. It’s certainly an honour for Alan Tough OAM who was recognised in the 2016 Australia Day Honours List yesterday with an Order of Australia Medal, the highest level of recognition awarded for outstanding achievement and service. Recognised for his dedication and support to people with disabilities in the wider community and to the sport of yachting. Westcare Incorporated President Alan Tough OAM, born and still living in Dalkeith attended Scotch College before gaining an Honours Degree in Mechanical Engineering and a Master’s Degree of Business from the University of WA. An extensive career in the local and international arena of engineering, finance, mining and government has augmented his outstanding voluntary service to the not-for-profit community and the sport of yachting whilst serving on several Boards. Alan Tough OAM, recognized jointly for his extensive service to support of people with disabilities, joined the Board of Westcare Incorporated in 2002 taking the helm as President in 2006. Westcare, whose head office is situated in Carrington Street, Nedlands, is a not-for-profit organization which provides quality employment, training and accommodation for people with a disability. The Westcare Industries include printing, box making, food packing, safety gear and Westcare Accommodation Services which operates in Shenton Park. During his tenure at Westcare, Alan has provided the CEO's and Board Members with leadership and mentoring to establish viable businesses in a competitive arena whilst increasing the commitment to employing people with a disability. Alan thinks beyond the boundaries and explores the big picture, he is innovative and challenges the system. He sweeps away barriers, opens dialogue, and builds trust with the leaders and external parties beneficial to the wellbeing of the organization. Jointly recognised for his service to the sport of sailing and boating, Alan was born into a well-known Dalkeith sailing family. Inevitably he too would be a sailor. However he has not only been a sailor, he has been a ‘slave’ to the advancement of the sport and an innovator enhancing the progress of yachting through a changing era - a contribution way above and way beyond the norm. Alan has been an active sailing advocate since assuming his first leadership role of Junior Captain at Claremont Yacht Club aged 11. He continued his leadership through involvement at Royal Perth Yacht Club, joining the Board of Yachting WA in 2002 and became Yachting WA President in 2005-2008. In 2009 he joined a small esteemed group when he was awarded a Yachting Western Australia Life Membership. Alan worked tirelessly to enroll every WA yacht club with the state body, Yachting WA, and created a standardized database for the 40,000 WA sailing members establishing a fair and equitable subscription system such that everyone could afford to belong and exercise their voting rights. His system impressed and was soon adopted by Yachting Australia, the national body. He not only improved relationships with the national body Yachting Australia, the yacht clubs and Government but was looked to for leadership and guidance by all. His efforts contributed to enhance the quality of sailing through numerous initiatives and quality training programs across the spectrum from junior entry to Olympic levels. He lobbied state and federal Government consistently and strongly to ensure the best outcomes with regard to a range of issues from Club leases, environmental constraints, public boating infrastructure and development opportunities. Not one to take ‘No’ for an answer without solid reason, Alan was and still is persistent and his work in improving the relationships with government has had a lasting effect in all spheres of his community involvement. An astonished but ever humble Alan Tough, surrounded by his proud family, responded to news of his honour saying "It’s certainly an honour to serve both yachting, my fellow sailors and the community. I continue to be inspired by the humour, perseverance and tenacity of the many people I meet who live life with varying disabilities. I am indeed grateful and thrilled by this recognition. " Congratulations to the winners of the 2015 Westcare awards which were presented on Thursday. In a break from tradition the awards, normally presented at the Westcare Annual General Meeting, were instead this year, presented at the Christmas party. Cheered by family and peers the award winners were presented their awards by Westcares’ Vice President Sue Morey assisted by Chief Executive Officer John Mitchell. Florence Hummerston Award for Outstanding progress by a Client in Accommodation Services was awarded to Tracey Voak. Dr Bob Elphic Award for Employee of the Year in Westcare Industries, Nedlands was awarded to Leanne Fairley. Dr Alan King Award for Employee of the Year in Westcare Industries, Bassendean was awarded to Brad Stickland. Dr Ken Carruthers Award an Encouragement Award to an Employee in Westcare Industries was awarded to Daniel Pinker. Linley Henzel Award for Staff Member of the Year for Service to the Association was awarded to Nathan Bullivant. Peter Wall Award for Outstanding Service to our Employees was awarded to Diane Henningsen. Magnificent moderate weather and a very light breeze combined with great food and good company saw another successful Christmas party for the supported employees and staff of Westcare. The Hawaiian barbecue was held in the beautiful gardens at Westcares Accommodation Services in Shenton Park where Lets Groove DJ Tim got everyone into the party mood. In a break from tradition, the annual Westcare Awards were presented at the Christmas function this year, witnessed by the winners peers. Due to injury President Alan Tough was unable to attend the event and the awards were duly presented by Vice President Sue Morey who was assisted by CEO John Mitchell. Thanks to all the staff who worked hard to make the day so enjoyable for the supported employees who were especially thrilled by a guest appearance by Westcare Ambassador Rick Ardon from Channel 7. Westcare President Alan Tough congratulated the winner of this year’s Alan King Westcare Grant, Dr Susan Peters and presented a cheque in the sum of $50,000. Dr Peters was unable to attend the presentation which was collected on her behalf by Nita Sodhi-Berry. “Westcare are continuing the medical thread with which their origins are linked. In these times continuous medical grants are a rarity however, it is my intention that we continue with the grant in support of medical research” pledged Alan Tough and affirmed by Westcare Vice President Sue Morey and CEO John Mitchell. Dr Alan King was one of the founding medical physicians who in 1941, established the Wooroloo rehabilitation and sheltered work facility for patients disabled by the tragic scourge of tuberculosis. The facility ultimately moved to Perth where it morphed through various transitional stages to Westcare. Westcare continues via their grant to support laboratory, clinical and epidemiological research into the cause, diagnosis, prevention and treatment of respiratory infections including tuberculosis and a commitment to fighting lung disease through world class research. Dr Peters research project is: WA miners’ morbidity from lower respiratory infections and association with exposure to diesel exhaust and silica dust. Westcares’ Board Members and CEO John Mitchell were amongst the honoured guests invited to the Alan King Westcare Grant 2015 Announcement and Function hosted by the Institute for Respiratory Health at the Harry Perkins Institute of Medical Research in Nedlands. Westcare President, Alan Tough welcomed the staff and supported employees at a special morning tea at Westcare Inc (Nedlands) in early celebration of the International Day of People with Disability which occurs annually on 3 December. A similar celebratory morning tea will be held later this week at Westcare Bassendean. International Day of People with Disability (DPwD) is a United Nations sanctioned day that aims to promote an understanding of people with disability and encourage support for their dignity, rights and well-being. Alan provided a brief background on the history of Westcare and its beginnings whilst everyone enjoyed the delicacies on offer. Mark Forrest, the new Director of Westcare Industries, today also marked his five week anniversary with the organization and thanked everyone for their support of his integration into the organization. Westcare observes this important date annually. Previously Westcare initiated the hosting of an annual breakfast celebrating the International Day of People with Disability. Attendance grew significantly to over 500 people as community awareness and support of the event grew. Ultimately Westcare's Chief Executive Officer John Mitchell, approached the National Disability Services WA to take over the event in an effort to broaden the focus and direction of the event to the wider disability sector. Westcare is proudly associated with medical research and annually provides the Alan King Westcare Grant to aid medical research. President Alan Tough and Chief Executive Officer John Mitchell along with Westcare Board Members represent Westcare at the annual Westfarmers’ Harry Perkins Oration held in honour of the founder of the Harry Perkins Institute of Medical Research. The 2015 oration by Professor Graeme Hankey was presented to a packed audience a fortnight ago on the subject - Stroke: challenging a looming epidemic. Pleasingly, attendance exceeded all expectation necessitating a change to a venue with a large capacity at the last minute and those attending were not disappointed. Every day, 13 West Australians are suddenly disabled by a stroke. The oration explained the concept of stroke and its causes, illustrated its impact and how it can be prevented and treated, and discussed future directions in research and its implementation into practice. Professor Hankey is Professor of Neurology, School of Medicine and Pharmacology, The University of Western Australia; and a Consultant Neurologist, Department of Neurology, Sir Charles Gairdner Hospital. He received his undergraduate medical training at The University of Western Australia, and trained in neurology at the Royal Perth Hospital, Australia; Mayo Clinic, USA; and Western General Hospital, Edinburgh, UK. His main research interests include epidemiological studies and clinical trials of interventions to prevent and treat stroke. Westcares’ annual presentation will be awarded in early December 2015 to the Institute for Respiratory Health at the Harry Perkins Institute of Medical Research. The excitement at Nedlands was tangible as this year’s appeal faces were revealed. Georgia Challis posed with Westcare Ambassador Rick Ardon, renowned Channel Seven news reader. Georgia recently joined the Westcare ‘family’ and has in a short space of time upskilled herself in the Westcare Print Industry where she works with nearly 40 people with disabilities, some of whom have been working at Westcare for over 35 years. Westcare Ambassador and stalwart supporter of the organisation, Rick Ardon dropped by for an impromptu visit. All visitors are eagerly welcomed but it was definitely “down tools” when Rick entered the building. A firm favourite, Rick brings in the same sunshine he exudes from behind the news desk and brightens the day for our staff. Thousands of seals for use on seasons greeting envelopes and gifts will be sent to homes across the Perth area to raise not only much needed donated funds, but also to raise awareness in the community of the need to support people with a disability. Now in its 70th year Westcare, originally called the Tuberculosis and Chest Association of Western Australia, continues to raise money for research into the appalling disease of Tuberculosis and also provides work and training opportunities for people with a disability. Today, more than ever, people are appreciating the fact that there is insufficient government funding to assist people with disabilities to receive the best possible training, support and accommodation they may need, highlighting the need for Westcares’ social investment today and into the future. Alan Tough thanked all donors and those who have pledged bequests to Westcare. Their support over the years enhancing the lives of people with disabilities has been inspiring and is most sincerely appreciated. We hope that as we enter this season of goodwill, more people will consider donating: even the smallest amount helps support those people in our community who are challenged in everyday life by some disability or another. 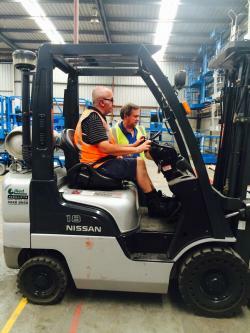 Congratulations to Maurice Flintoff who has overcome all odds to obtain his Forklift Certification. This is easier said than done as Maurice has a literacy disability. Maurice joined Westcare 24 years ago as a supported employee. Currently he works as a delivery driver for Westcare Print Industry. You may well ask how does he get around town to do his deliveries and collections when he can’t read? Maurice has an amazing memory, almost photographic – he looks at the map and memorises the diagrammatical aspects and somehow figures it out. He is out and about town daily and very rarely ever gets lost. Known as Mr Fixit Maurice has the ability to turn his hand to anything and everting from renovations, repairs, pulling to pieces machinery and putting it back together again. The first thing Maurice tells people when they commence work at Westcare is that he cannot read or write so they must give him verbal instructions. Marueic is the holder of the prestigeuous Bob Elphick Award. Westcare CEO John Mitchell encourages supported employees to maximise their potential and where possible extend themselves. During the recent Greenacre Wage Assessments Maurice expressed his desire to undertake training and obtain his fork lift license. Maurice previously, very ably, drove the company forklift but when the need for certification came in legislation prevented from doing so without a license. The theory component of obtaining that license appeared to be an insurmountable hurdle despite the organisation needing skilled forklift driver. Westcare Print Manager Andrew Larter co-opted the willing and eager Support Services Officer Sherry Kaur, who found assessor Alan Baker at Correct Training Services. Alan immediately understood the problem, putting Maurice through his paces on a one to one basis. Maurice, with Sherry reading him the theory questions and writing down his answers, was successfully awarded his Fork Lift License. Westcare has held its top spot in the Australian Department of Social Services Disability Employment Assistance – Activity Performance Summary Chart. The DSS charts the activity performance information of the Australian organisations offering disability employment assistance throughout the year. Providing valuable information to each disability organisation, they are measured against the State and National average. Included in the demographic indicator information charted is for example, information on the average age of employees, percentage of employees who identify as CALD, percentage of employees wo identify as indigenous, supported employees aged 65+, supported employees aged 50+, average weekly wage, average hourly rate etc. 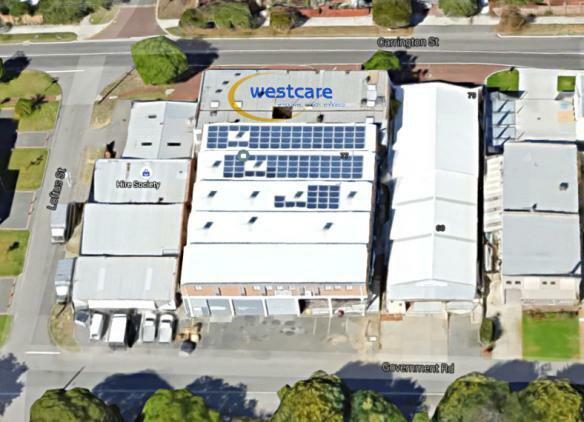 Westcare has embraced solar energy which has proven to be a solid investment at both their Nedlands and Bassendean commercial sites. The 30KW solar power systems, each with 120 panels and micro inverters, are installed at both of Westcare’s Industries locations. The first six months of solar operation has resulted in noticeably reduced power bills and a significant saving for Westcare Incorporated. “The operational benefits are clearly lower operating costs for Westcare Print, Westcare Foodpak, Westcare Box and Westcare Safety. This translates into more bottom-line surplus or the ability to be more competitive in the market with lower overheads and the ability to offer discounts to win work without eroding current margin” said Chief Executive Officer John Mitchell. “Payback period for the system is approximately 2 years depending on power usage & solar power generation, moving to a zero cost base over time” said Mitchell who is cognizant of the need for Westcare to reduce their carbon foot-print and increase their green-stamp credentials. Sherry Kaur is Westcare’s newest employee having accepted the job of Support Services Officer at Westcare Industries’ Print Division where she is working alongside Dawn Boyce. Sherry is no stranger to Westcare as she and her husband Yash have lived in the Westcare Village, Shenton Park, for two years where they undertake the caretaking role. Sherry and Yash have made quite an impact on the residents and staff. It’s like one big family at Westcare’s Accommodation Village and this has been especially highlighted with the arrival of their baby girl who is now surrounded by doting aunts and uncles. Sherry, a registered nurse who is also qualified in Welfare Work and Care, moved with Yash from South Australia in 2013. Westcare is proud to release their 2015 Annual Report for presentation to its Members. Westcare has again fully maintained their social purpose commitments this year, and despite the knock-on effects of the mining industry downturn, has reported a solid outcome. Westcare encourages you to read the 2015 Annual Report and to read about the past years events. The Department of Social Services (DSS) produce quarterly results for disability services organisations such as Westcare, and matches them against state and national averages for other organisations in Australia. These results are called API Reports and track specific demographic and activity performance as specified by DSS. Westcare has consistently performed above the State & National averages over a sustained period of time. The latest results are available for viewing. The WADE alliance, of which Westcare is a member, were recently awarded Social Enterprise of the year. This was a national program to identify those organisations operating in a less than traditional businesses. It was recognised at Federal level that the WADE program in WA was innovative and unique in Australia. There are now moves at Commonwealth level to roll out similar programs in all other states and territories. Westcare would like to thank Lotterywest and the WA State Government for their continuing support. Andrea Mitchell MLA, Member for Kingsley, presented Westcare with a Lotterywest Grant Certificate for the considerable amount of $816,194. Also in attendance were Lotterywest Board member Ms Andrea Hall together with John Dalton from Broadway News. The grant will enable Westcare to renovate canteens and recreation areas at Westcare Nedlands, Westcare Bassendean and Westcare Accommodation Services. Plus, at Westcare Accommodation Services the grant will fund a further 8 ensuited rooms for people with a disability. Providing Australian business with first class goods and services and Western Australians with disability the opportunity to demonstrate their skills. Westcare, in conjunction with the Lung Institute of Western Australia, would like to announce that Winthrop Professor Peter Le Souef is the 2013 recipient of the Alan King Westcare Grant. The Alan King Westcare Grant is for $50,000 for one year and is available to support laboratory, clinical and epidemiological research into the cause, diagnosis, prevention and treatment of respiratory infections including tuberculosis. W/Professor Peter Le Souef's project is entitled 'cytokine profiles associated with acute lower respiratory infections in African children (ALRI)’. It is recognized that ALRI is the leading cause of childhood mortality worldwide, accounting for an estimated 1.3 million deaths each year in children under 5 years of age, and the highest mortality rates are in sub-Saharan Africa. Younger children are most vulnerable, as 81% of these deaths occur before two years of age. The project will be able to determine whether one or more cytokines can be used as a biomarker for determining whether a serious ALRI is viral or bacterial. This novel approach has the potential to lead to the development of a cheap test on heal-prick blood to identify whether a child presenting with an acute severe ALRI requires intensive antibiotic treatment due to the causal agent being bacterial. In the African setting health care costs are critical, a more focused approach could both improve outcomes and reduce costs. Importantly, these analyses will allow the researchers to determine whether viruses alter cytokine profiles and whether these changes are virus-specific. They will also allow W/Professor Peter Le Souef and his team to determine whether virus-specific changes are associated with reciprocal reductions in anti-pneumococcal or anti-haemophilus antibodies and infection with these two bacterial agents. This information has the potential to substantially increase knowledge of the causes and mechanism of acute severe ALRI in an African setting and to allow new approaches to prevention and therapy to be developed.